Happy Tuesday--time for a new challenge at CASology. Our cue word this week is PET. I think this is a really fun one. I was going to make a card with a dog on it, since I am in love with the puppy we adopted almost a year ago. However, I think a lot of people have puppies as pets, so I decided to feature our other pet...Ace the Rat! Many people do not know that rats make terrific pets--they are clean, furry and very sweet. So, this week was supposed to be Ace's turn for the spotlight. I fell in love with Avery Elle Storybook stamps, mostly because of the cute rat image (actually I think it is a mouse, but I never told Ace that.) I paper pieced a little scene in honor of our pet rat, Ace. Now, for the sad news....Ace died last Thursday--after I made this card for him, but before I needed to post it. He lived a long life (for a rat) and was loved so much. We really miss him. Here is a picture of Ace with his adopted puppy brother, Sherlock. Now, it is your turn. What do you think of when you see the word PET? What pets do you have? What is the most unusual pet you have ever had? 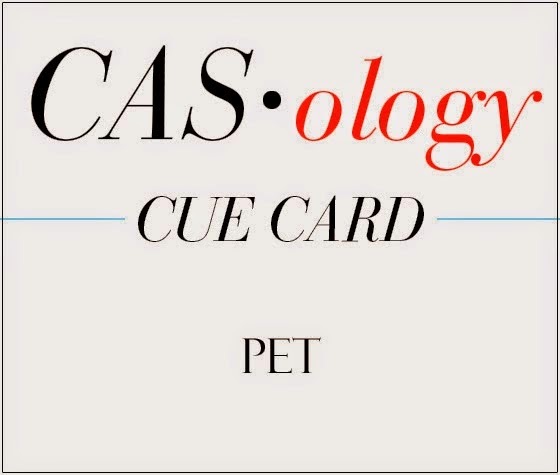 Have some fun with the cue word PET, and then please link up your creation on the CASology blog by Monday at noon (CST). If you'd like, please post a picture of your pets--I think it would be fun to see your pets. Check out the beautiful designs from the CASology Design Team members and see how they were inspired by PET. I'm sorry to say that rat doesn't cross my mind with the word 'pet', but I'm equally sorry that Ace is no longer with you. Love your bright, cheery card! Poor little guy, he looks quite cozy with his brother. Your card dedicated to him is darling Joyce! I'm another one who doesn't think of rat when I think of the word pet but I'm glad Ace was such a good pet for you all and am sorry that he is no longer with you. Love your card Joyce, that image says you need to buy that set Tracey. So sorry about Ace, Sherlock will miss him! Pretty card- still not going near a rat! Sorry to hear about your pet - but the card you made in his honor is so fabulously CAS!! I really love it!! I'm so sorry to hear about Ace...What a great card you created with him in mind, though! Beautiful paper piecing, and I love your CAS design! Love your memorial for Ace. Sorry for your loss. So sorry to hear of Ace's passing. He will be forever in your hearts. Oh...so sorry about Ace...I know how much you loved him...cute card and a great tribute to your kids first pet! So sorry to hear about Ace...you've spoke of him before so I know how special he was to all of you. Personally not a fan of any rodents except for the cute paper pieced one on your pretty card! So sorry about Ace... but what a nice way to give him a little tribute. Such a sweet card! Sorry to hear about Ace. Cute card. Love the picture of your dog with his friend. We had a pair of white rats when the kids were small and I agree, they make great pets. They're just one of those misunderstood animals! Sorry to hear about Ace--but I'm sure he had a great life. Love your sweet card! Oh, Joyce I am so sorry about Ace! This is one of my favorite pictures! Happy to have met them both in person! Your card is perfect!, How is Sherlock without Ace? So sorry to hear of your loss, Joyce! Love this card and the meaning it has in your heart! Hugs to you!!! Joyce...I am so sorry to hear about Ace, such a sweet little critter and his card is just precious. I love your photo of Ace and Sherlock, adorable. Oh, Joyce, I'm so sorry to hear about Ace! I'm glad you could immortalize him with this gorgeous card though. And I love the picture of him with Sherlock - so sweet! I have 422 cats. Okay, really just 5 but some days it seems like hundreds. We also have 2 tanks of fish and a desert pack rat in the yard we leave leftovers for (and he pulled out all the potted plants in thanks). We have had hamsters in the past. I do know that rats can make awesome pets. I am allergic to their claws though so no rats for us. Sorry to hear about Ace's passing. That's a sweet photo of him with his canine friend and a sweet card too. Ace sure was a cutie...sorry for your loss, but your card is quite precious. Love the picture of Ace with Sherlock! I'm sure he loved the card though! By the way... you have an adorable dog!